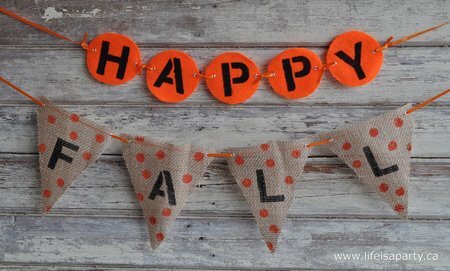 I wanted to make a “happy fall” banner for a little get-together we’re planning, and here’s what I came up with. 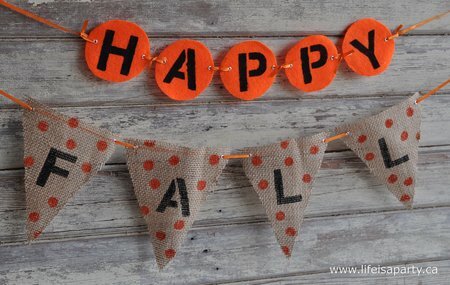 I used a cup and traced orange felt circles for the “happy”, and cut out simple triangles for the “fall” bunting. I used a dollar store stencil and some black craft paint to add the lettering. Since I was just doing one letter per piece, I didn’t have to tape down the stencil, I just held it steady, making this a really quick and easy project. 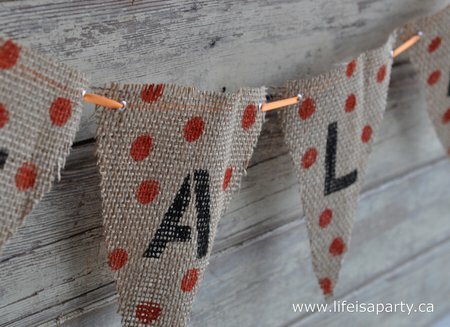 I also added fun polka dots to the fall bunting. I used the end of a marker, since it was about the size of the dot I wanted and dipped it into the paint and then onto the bunting. To string up the banner, after the lettering dried over night, I added grommets. 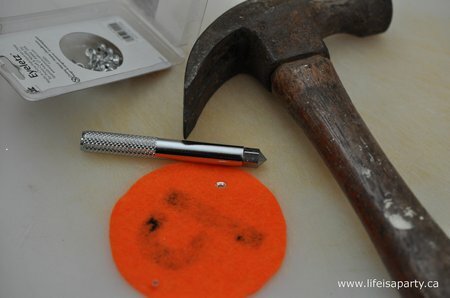 They are simple to use, you just need the special little tool, I got mine at the dollar store a few years ago, and a hammer. To start you snip a tiny hole, then insert the grommet from the front, and hammer it closed with the special tool from the back. Easy peasy, and really cute. 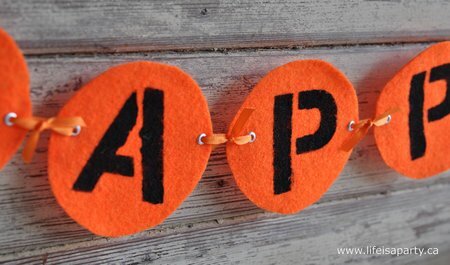 I used some orange ribbon to thread them all together. 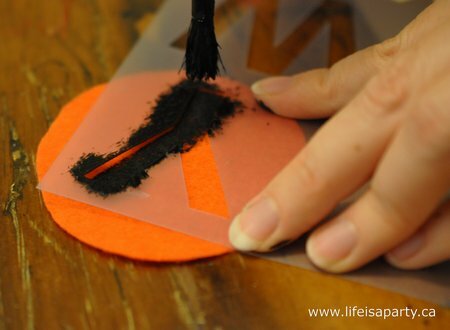 I love how the little banner turned out and think it will be a great fall decoration to use year after year. Sometimes life is really a party…a fall party! This post is linked up at 36th Avenue, Craftberry Bush, Tatertots and Jello, Whipperberry, Tidy Mom,Lil’ Luna, All Things Burlap,and French Country Cottage. Love, love, love this project. Gotta get one of those tools! I may use a q-tip for the dots or rubber ended pencil?!?! Very cute banner. So rustic and festive! I love burlap and polka dots!